After Jesus was baptized, he was led by the Spirit into the wilderness and for forty days he was tempted by the devil. Jesus fasted during those forty days. That means he didn't eat anything during that time, and of course, at the end of the time he was very hungry. Satan saw this as an opportunity to tempt him again. He said to Jesus, "If you are the Son of God, command that these stones become bread." Jesus answered, quoting from the book of Deuteronomy; "It is written, ' Man shall not live by bread alone, but by every word that proceeds from the mouth of God'". You will remember that when the children of Israel were in the wilderness, they became hungry, and God fed them with special food called manna which fell from heaven. He showed them that they were dependent upon him for all their needs. The devil took Jesus up on a high mountain and showed him all the kingdoms of the world in just a moment. Then he told him that he had been given the authority to give those kingdoms to anyone he wished. Had he really been given that authority? Remember, the devil is a liar. God rules in the kingdoms of men and it is He who gives power to the people He wants to have that power. Satan told Jesus that if he would worship him, he would give him all those kingdoms. Jesus replied, "Get behind Me, Satan! For it is written, 'You shall worship the Lord your God, and Him only you shall serve'." Again Jesus is quoting from the writings of Moses in Deuteronomy. Satan tries again. He brought Jesus to Jerusalem and took him up to the highest part of the temple and told him to jump off. He said that angels would come and lift him up so that he wouldn't be hurt. 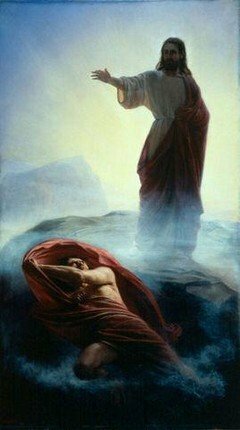 Jesus answered him, "It has been said, 'You shall not tempt the Lord your God'." Satan gave up and left him, but he would return later when he thought he had an opportunity to get Jesus to sin. Of course, we know that he never succeeded. After Satan left, angels came and helped Jesus. There were also other times in his life that angels came to help him. Once when Jesus was talking about who was greatest in the kingdom of heaven, he called a little child to him and told the people that they must become as little children. He said, "I say to you that in heaven their angels always see the face of My Father who is in heaven." We are told by the writer of the book of Hebrews that there are 'ministering angels' who are sent to help those who are saved. What a comforting thought! When Satan tried to get Jesus to do wrong, Jesus always answered him with scripture. In Matthew's account of the story, with each temptation, Jesus said, "It is written", and then he would quote the scripture. You can study and memorize Bible words and "hide" them in your heart to keep from doing wrong. If you do this, you will always know how you should act in any situation. Think about how Jesus would act. English Bible Activities Select story #175 in the list for activities to accompany this Bible story. Spanish Bible Activities Select story #175 in the list for activities to accompany this Bible story. 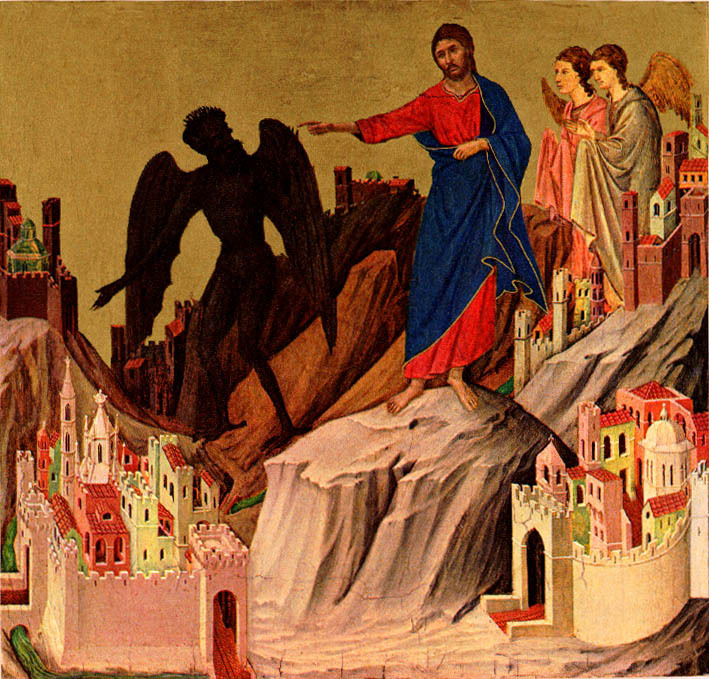 Press "Go" to search for books about The Temptation of Jesus. Picture "The Temptation of Jesus"
this is very helpful to young ones who want to learn more about our one and true Jesus!!!!! This page displayed 272,711 times.